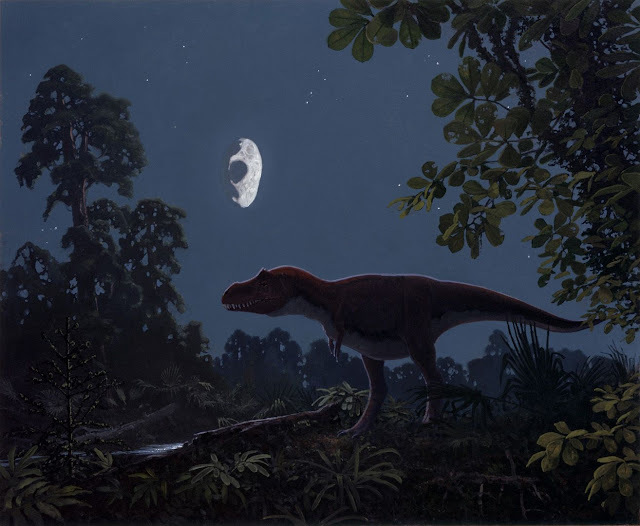 NJB Article and Source Repository: Tyrannosaurus Rex by Paleo Artist Simon Stålenhag. Tyrannosaurus Rex by Paleo Artist Simon Stålenhag. Tyrannosaurus Rex. Simon Stålenhag/Swedish Natural History Museum. 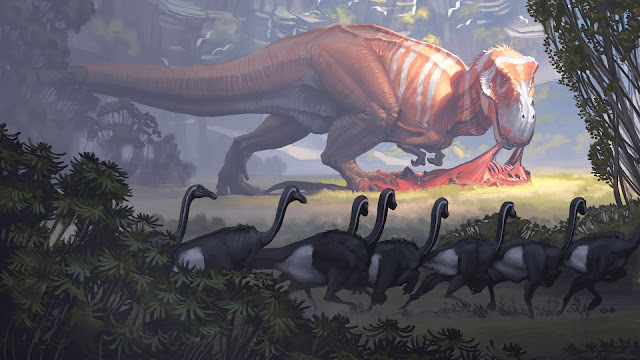 Tyrannosaurus rex tearing apart a carcass while a flock of nervous herbivores skitter by in the foreground. Tyrannosaurs were mostly small and unimportant for the better part of their 100-million-year history. But in the final 20 million years of the Cretaceous before the mass extinction, some species like T. rex reached outrageous size and fearsomeness. — Peter Brannen, The Ends of the World: Volcanic Apocalypses, Lethal Oceans, and Our Quest to Understand the Earth’s Past Mass Extinctions. The Simon Stålenhag Art Gallery on the World Wide Web. The Artists Who Paint Dinosaurs. By Ross Andersen. The Atlantic, October 5, 2015. More Paleo art at Jurassic Mainframe. Rise of the Tyrannosaurs. By Stephen Brusatte, Scientific American, May 2015. What Killed the Dinosaurs. By Stephen Brusatte. Scientific American, December 2015. Ascent of the Mammals. By Stephen Brusatte and Zhe-Xi Luo. Scientific American, June 2016. The Unlikely Triumph of the Dinosaurs. By Stephen Brusatte. Scientific American, May 2018. Tyrannosaurus rex with the Chicxulub asteroid hovering in the sky, moments before the catastrophic impact that would have released, all at once, far more energy than all the nuclear weapons ever detonated. —Peter Brannen, The Ends of the World.